Pakistan's foreign ministry spokesman Nafees Zakaria briefs media at the Foreign Office in Islamabad, Pakistan, Sept. 29, 2016. Pakistan has announced it will postpone a November meeting of the heads of South Asian countries, blaming arch-rival India for derailing the process of regional cooperation. The move Friday comes amid escalating border and diplomatic tensions between Islamabad and New Delhi over allegations Pakistan was behind a deadly assault earlier in September on an Indian army base in the divided Kashmir region. India earlier decided not to attend the summit of the South Asian Association for Regional Cooperation, or SAARC, citing what it called cross-border terrorism, charges the Pakistan government rejects. Pakistan, which was to host the summit, said it deplored India's decision not to attend, according to a foreign ministry statement issued in Islamabad. "The spirit of the SAARC Charter is violated when a member state casts the shadow of its bilateral problems on the multilateral forum for regional cooperation," it said. The United Nations on Friday said it was deeply concerned about the increase in tensions between the two nuclear-armed neighbors. "He calls on the Governments of Pakistan and India to address their outstanding issues, including regarding Kashmir, peacefully through diplomacy and dialogue. His good offices are available, if accepted by both sides." India has vowed to try to diplomatically isolate Pakistan for its alleged support of Islamist groups on its soil, groups India says are behind terrorist attacks in neighboring countries. Staying away from the SAARC meeting appears to be part of India’s efforts. Three other members of the group, Afghanistan, Bangladesh and Bhutan, have pulled out of the summit, backing Indian concerns. The rivalry between India and Pakistan, the two largest members of SAARC, has long been blamed for keeping the organization from becoming an effective forum to deal with the challenges facing the poverty-stricken region. "The decision by India to derail the summit effectively contradicts Prime Minister [Narendra] Modi's own call to fight against poverty in the region," the Pakistan foreign ministry statement said. An Indian army soldier arrives at the army base which was attacked by suspected rebels in the town of Uri, west of Srinagar, Indian-controlled Kashmir, Sept. 18, 2016. While New Delhi blamed the September 18 attack on Pakistan-based militants, Islamabad denied any role and called it an attempt to deflect attention from alleged human rights abuses by Indian security forces in the disputed Himalayan region. 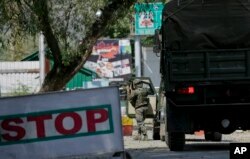 Tensions escalated further Thursday when the Indian military said its soldiers crossed into Pakistani Kashmir and conducted predawn strikes against terrorists there. Islamabad swiftly rejected India’s claims as "falsified, concocted and irresponsible statements" and said the Indian strikes are another incident of cross-border firing in which two Pakistani soldiers were killed while nine more were wounded. Exchange of fire across the Kashmir frontier broke out again early Saturday and continued for several hours, the Pakistani military said, blaming India for initiating the incident. There were no reports of casualties. The border skirmishes have raised fears of another conflict over Kashmir. The region is claimed by both countries and has sparked two of the three wars between India and Pakistan since they gained independence from Britain in 1947.